We provide caring money management, structure and support so you can enjoy a worry-free financial life. Ready to live the life you want free of money worries? Here's how we help. We go through your finances with you and create a plan to relieve you of your money worries so you can start to enjoy life again. We pay your bills for you and even contact anyone calling you about late payments, all while you relax without money worries. Once your budget is up and running you will stop wondering where your money goes and start making every dollar matter. MyBudget helps you make the right decision about your money. It's easier to make good decisions about money when you have visibility and control over your finances. One of our friendly consultants will talk with you, confidentially, about your situation, answer your questions and book a free budget consultation for you. Our personal budgeting specialists are highly-trained. They have a tertiary qualification in finance, such as a Certificate IV or Diploma of Finance and Mortgage Broking. They are also professionally trained in budgeting and debt management. More importantly, they genuinely care. They'll gather detailed information about your finances and create a customised budget plan to start achieving your goals. As a MyBudget client, you have 24/7 access to your budget via our secure members’ website and client app. Just like a bank account, you can view your balance at a glance and search transactions. But here’s the powerful difference - with MyBudget you can also see all of your future transactions for the next 12 months. With the right budgeting tools and our support, you have the confidence to make good financial decisions. Make a change to your budget and our system will immediately show you how it affects all of your future payments and projections. Why wait? Take control today. You've got nothing to lose. It could be one of the best decisions you've ever made. Fill out the form below and we'll call when it suits you. A budgeting expert will examine your financial position in detail during a free, no obligation consultation and create a budget for you that outlines your options to clear debt, start saving and achieve your financial goals. The plan we create is yours to keep for free at the end of the consultation – regardless of whether you become a client or not. We charge an initial set up fee and ongoing administration fee. However these are budgeted into your plan and spread out over time – so no need to pay upfront. Our fees are a fraction of what you could pay in interest and late fees over the lifetime of your debts. How long does it take to set up MyBudget? From the moment you pick up the phone we start working on a budget for you. You can see a Money Expert the next day and your budget starts working for you as soon as you're ready for us to start doing the legwork for you. 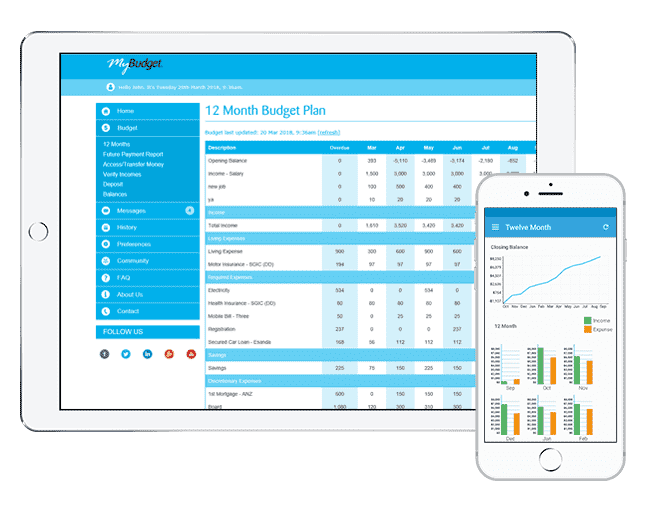 Why is MyBudget's approach so successful? Get expert help from people who care. MyBudget strives to find a solution for every individual. Unlike an App or spreadsheet program, our experts create a plan that’s specially designed to address your needs and priorities. We also understand that the hardest part about budgeting is sticking to it. That’s why we do the legwork for you. We can manage your budget, pay your bills, save for you, and communicate with your creditors, if necessary. Succeeding is easier when you have a team of experts supporting you along the way!